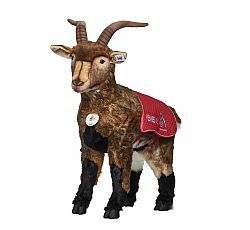 Whatever happens he stands proudly behind FC Cologne – and from now onwards he belongs to the ranks of the award-winners of the Promotional Gift Award 2018, because he was distinguished in the category Merchandising: the life-size goat Hennes VIII. by Steiff, a 100 cm high plush version of the probably most famous mascot of the German football league. Hennes has accompanied FC Cologne since 1950, in the meantime in the eighth generation. Produced as a limited edition of 248 pieces, FC fans can now take the life-size, housetrained mascot home with them for the first time ever. The price had a historical background: 1,948 Euros to match the foundation year of the club and the item was limited down to 248 pieces because Hennes was implemented for the first time on 24 August 1950, the figure also refers to the foundation year and month of FC Cologne, namely February 1948. As with all Steiff products Hennes VIII. was made by hand from more than 30 pattern pieces. Airbrush details lend the “made in Germany” goat its special look. An imprinted neck mark and an embroidered blanket accentuate which club he belongs to; the gold-plated “button in the ear” documents the quality and exclusivity of the Steiff original.